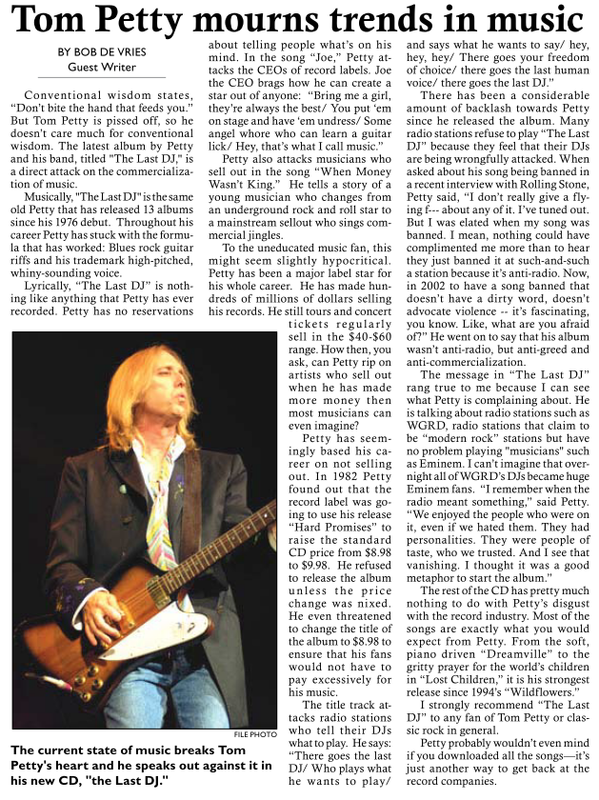 Music Review: Petty takes shots at music industry? Recently being inducted into the Rock and Roll Hall of Fame, Tom Petty and the Heartbreakers have not changed their sounds since they released their first album in 1976. With a 26-year history, Tom Petty and the Heartbreakers have received 12 gold and platinum records. Songwriting might be difficult for some artists, but for Tom Petty it seems to come naturally. On his latest album, "The Last DJ," Petty expanded his classic rock sound to a new level. While taking shots at the music industry, Petty also expresses his views of society. The album is what Petty calls, "a little story." You need to hear the whole thing to really understand it. The album shows similarities to Neil Young, with its aggressive lyrics backed with strong instrumental power. 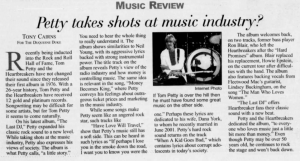 The title track on the album reveals Petty's view of the radio industry and how money is controlling music. The same idea is relevant in the song, "Money Becomes King," where Petty conveys his feelings about outrageous ticket prices and marketing in the music industry. Over the past 25 years the music world has seen many artists and styles rise to fame and, at some point, fade away. There was the classic rock og the 1970's, the hair metal and "new wave" bands of the 1980's, the Seattle grunge scene in the early 90's, the recent explosion of boy bands and "nu" metal and finally there's Tom Petty. An artist who has lasted through all these trends and is still able to write great music. On Oct. 8, Tom Petty released his thirteenth studio album entitled, The Last DJ. The CD contains 12 tracks and is just about 50 minutes long. The title of the album hints at its theme: the music industry is at its all time low. He is addressing the fact that money controls the airwaves today. The industry is more about business than music; it's more concerned with money than art. Today, dj's on commercial radio do not have the freedom to play whatever songs they want. They are required to promote certain bands and songs. (That's why you should listen to WIXQ. It's all about the music.) This concept is much different from the way things were when Petty was making a name for himself. Petty feels that this control of corporations threatens out freedom of choice, and he shares his hope of things returning to the way they used to be. Editor's Note: The microfilm scan was of poor quality and the writer's name was obscured. Sorry! If recent Billboard charts are any indication, the listening public is unhappy with new music, and is turning to the great rockers of past generations to fill the void. Tom Petty and the Heartbreakers are certainly no exception. Petty's latest effort, "The Last DJ," debuted at No. 9 on the Billboard charts, behind acts like The Rolling Stones, Bon Jovi and Elvis. Plenty of artists have written songs about the greed and bottom-line stupidity that spoils the music business. Not content to stop there, veteran rocker Tom Petty spends an entire album grinding his teeth over the subject. Getting past the musical content -- semi-acoustic pop-rock accompanied by lots of strings -- The Last DJ is far too humourless to work as satire and too direct to be palatable as a diatribe. 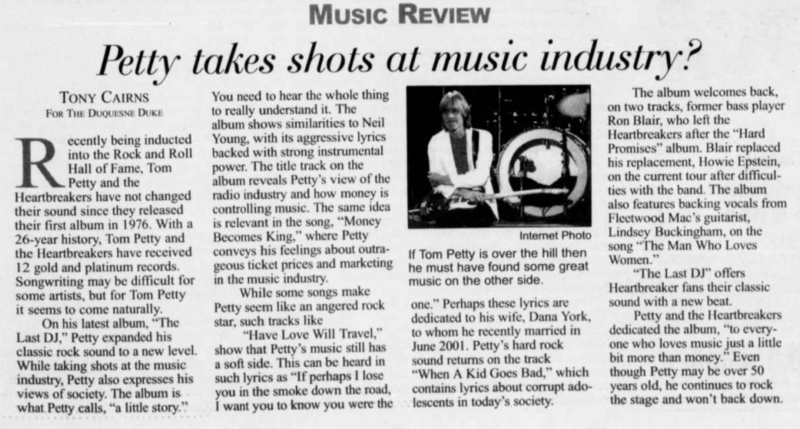 While every passionate music lover on Earth probably agrees with Petty's assertion that today's record-company execs are a bunch of soulless bean-counters, you need to really love the man to endure his sophomoric prose. For starters, take the chorus from the title track: "There goes the last DJ / Who says what he wants to say / And plays what he wants to play / Hey hey hey." Dr. Seuss must be so proud. Tom Petty isn't satisfied to just bite the hand that feeds on his latest disc, a scathing indictment of the record industry. He chomps the entire hand off and spits it out in disgust. Petty's attack on the record companies and radio conglomerates that promote mediocrity over creativity is a righteous cause. And the music is great, a typical Petty collection of snarling rockers, cockeyed pop, and balladry. The disc starts with the title track, an acoustic-based song that introduces Petty's protagonist, a disc jockey who refuses to conform to the powers that be. The DJ is a typical Petty character, a loner who remains an outsider even as he comments on what's going on around him. Tom Petty and the Heartbreakers have been pumping out hits for almost three decades. Their latest album, "The Last DJ," is sure to add a few more to the list. 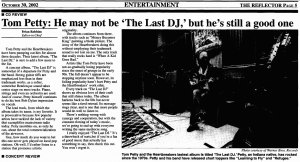 A concept album, "The Last DJ" is somewhat of a departure for Petty and the band. Strong guitar riffs are emphasized less than in their trademark works, as a softer, somewhat Beatlesque sound takes center stage on most tracks. Piano, strings and even an orchestra are used. And of course, Petty himself continues to do his best Bob Dylan impression on vocals. The lead track, from which the album takes its name, is my favorite. It is provocative because few popular artists have tackled the lack of variety that exemplifies mainstream radio today. Petty mumbles on, as only he can, about the total commercialization of the airwaves. Conventional wisdom states, "Don't bite the hand that feeds you." But Tom Petty is pissed off, so he doesn't care much for conventional wisdom. 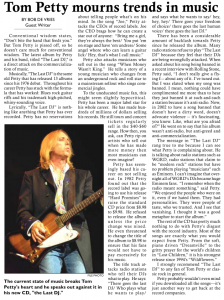 The latest album by Petty and his band, titled "The Last DJ," is a direct attack on the commercialization of music. Musically, "The Last DJ" is the same old Petty that has released 13 albums since his 1976 debut. Throughout his career Petty has stuck with the formula that has worked: Blues rock guitar riffs and his trademark high-pitched, whiny-sounding voice. Lyrically, "The Last DJ" is nothing like anything Petty has ever recorded. Petty has no reservations about telling people what's on his mind. In the song "Joe," Petty attacks the CEOs of record labels. Joe the CEO brags how he can create a star out of anyone: "Bring me a girl, they're always the best / You put 'em on stage and have 'em undress / Some angel whore who can learn a guitar lick / Hey, that's what I call music." Tom Petty has a lot of nerve. And his new album is sure to raise some tailfeathers. With "The Last DJ," Petty and his band the Heartbreakers — featuring guitarist Mike Campbell, keyboardist Benmont Tench and drummer Steve Ferrone — doesn't just take swipes at the big corporate record companies. They reach back and punch them right in the guts. And that's a giant step for classic rock; when was the last time anyone heard a recent Petty song or a recent Eagles song on the radio? Tom Petty has always managed to maintain his distinctive blend of Brit rocker, garage rocker and Dylanesque balladeer while thumbing his nose at corporate America. The 12 songs on The Last DJ find Mr. Petty and the Heartbreakers still on top of their sound and shunning the idea of sponsored tours of contrived boy band radio hits. The title track holds a mirror up to the record business while the cynical Money Becomes King rings with sincerity. Mr. Petty seems to have plenty of angst left in him. Other standout material includes the up-tempo Have Love Will Travel, the country-rock Blue Sunday and the jangle pop of You and Me. Mr. Petty is growing older, but his approach to music hasn't changed.